Secular Pro-Life Perspectives: Viability = Personhood? In the never-ending debates over what it means to be a "person" (as distinct from a human being) I've seen many people claim that you cannot be a person unless you are viable, i.e. a fetus is not a person until the fetus can live outside the mother's body. The first counterargument I usually hear (or give) is that patients on respirators or people using dialysis or the like are not somehow less of people--they don't lose personhood due to their physical dependence. Viability exists as a function of biomedical and technological capacities, which are different in different parts of the world. As a consequence, there is, at the present time, no worldwide, uniform gestational age that defines viability. Viability is not an intrinsic property of the fetus because viability should be understood in terms of both biological and technological factors. In other words, a fetus gestating in the United States, whose mother has access to advanced medical technologies, may be able to survive outside the womb at an earlier gestational age than if the exact same fetus were gestating in Rwanda. If personhood depends on viability, the fetus is a person while in the US, and ceases to be a person if the mother travels to Rwanda. ....This makes no sense. No definition of personhood should boil down to geographic location. You guys are so compassionate about life that you're willing to force women to give birth to something when they don't want to. Obviously that shouldn't have been sleeping around and now they have to PAY FOR IT! Enjoy your new baby. Ever heard of birth contol or adoption, troll? Murder is not the answer. You care so much about life that you support Paul Ryan, who wants to cut domestic programs designed to help the most vulnerable populations by 60%. Go ahead and vote for Republicans, as you think you're saving people's lives when you're really just voting for ruining them. It's all the republicans fault. Typical liberal blame game vast generalization and unrelated to the topic. That's right Dana. For pro-lifers, the first thought is the woman should consider adoption, as there are hundreds of thousands of childless, loving couples looking to adopt a baby. For a pro-aborsh person, the first thought to deal with an unwanted pregnancy is murdering the child in the womb. I had a correspondence with a Pro-Choicer who took the viability stance where she only had the right to evict not kill but it was due to nature that the early foetus died while a late term could survive. What I couldn't work out is you still need to override a woman's bodily autonomy to force her to either go to term or to induce labor if sh wanted to evict late in the pregnancy. But if you have a right to evict but not kill that equally applies to the early foetus. But this is only part of the larger problem when considering bodily compensation. "Additionally, "personhood" should be an intrinsic property of a human, shouldn't it?" Did you have any elaboration, or is this more of a "nuh-uh!" type stance? Okay mr anonymous, HOW CAN YOU HAVE HUMAN DNA AND NOT BE A PERSON!? It's scientific fact that if you have human dna, you have the same legal status as a completely born, aware, and rational person. The law makes no distinction between mental capacity, maturity, and humanity. If you have human dna, you are entitled to human rights. It's all there black and white clear as crystal. This is why abortion needs to be made illegal. Not only is it immoral from a christian standpoint but it violates international human rights laws. You could only be against abortion being made illegal if you support child murder and sexual promiscuity. Jimbob, it's a waste of time to try to teach a dog to whistle (I've tried). It's a waste of time to teach a fish to dance the polka (haven't tried). And it's a waste of time to argue or reason with trolls. They are pro-abort no matter what and nothing will ever change their minds. "...to give birth to something..."
We don't give birth to things. We birth PEOPLE. We are talking about SOMEONE. And that's the only reason we need to oppose abortion. We don't want to punish anyone. Children are not a punishment. Actually the debate concerning our ontology isn't so clear cut. Read up on the Personal Identity debate, there are plenty of good introductory articles if you google Personal Identity and philosophy. With regard to the graphic, please note that the laws against abortion after a certain number of weeks of gestation are inconsistent with Roe v. Wade. See the Planned Parenthood v. Danforth decision. I am a pro-choice person. However, I do not think abortion is a good thing, and admit that it is very difficult to defend abortion as a practice in itself. However, the one thing that overrides all points in this debate is that we tried banning abortions. It didn't stop abortions from happening. Thousands of people still tried to abort, they just did it in dirty, backalley offices; or with coat hangers (remember those? ); or a myriad of other "methods" that were dangerous to both the child and mother. Roe v Wade happened for a reason, because we had so many women dying trying to abort. Making something illegal doesn't stop people from trying to get it. 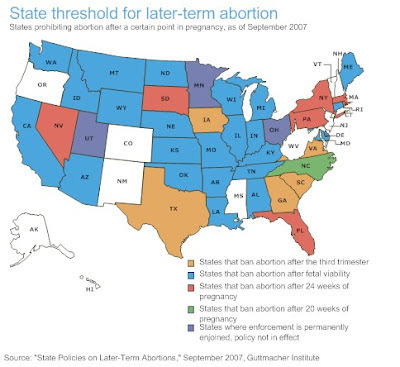 If you really want to stop/reduce abortions, the way to do it is through education and public outreach, not an outright legal ban.